A Buddhist novice collects alms from anti-government protestors during a special New Year's merit making ceremony at Democracy Monument. Making merit is an important concept in Buddhism. I'm paraphrasing here, but it basically is the belief that the accumulation of good deeds, acts and thoughts can carry a person through several incarnations. So building up merit in this life can help ease you through your next life or subsequent lives. It's why you see people on the streets in the mornings waiting to give food and drinks to the monks who live in nearby temples (this is a common site not only in Thailand but also in Theravada Buddhist countries around Thailand). Making merit is so ingrained in Thai culture that you see it almost everywhere you turn. In big ways at temples and shrines or in small ways when people leave small offerings in front of their shops and homes. Even in a city like Bangkok, which is as frenzied and chaotic as New York or any other megalopolis (this is a city of 14 million people including the suburbs), the spiritual is all around you. 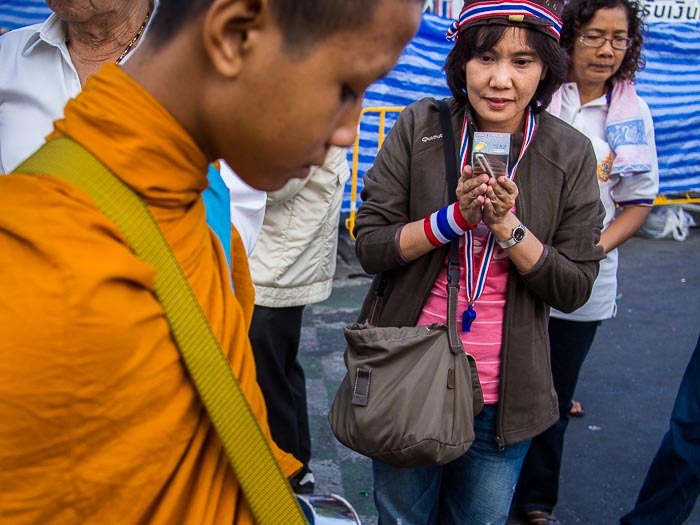 About 100 Buddhist monks came down to the protestors' base at Democracy Monument on New Year's Day for a special merit making ceremony. 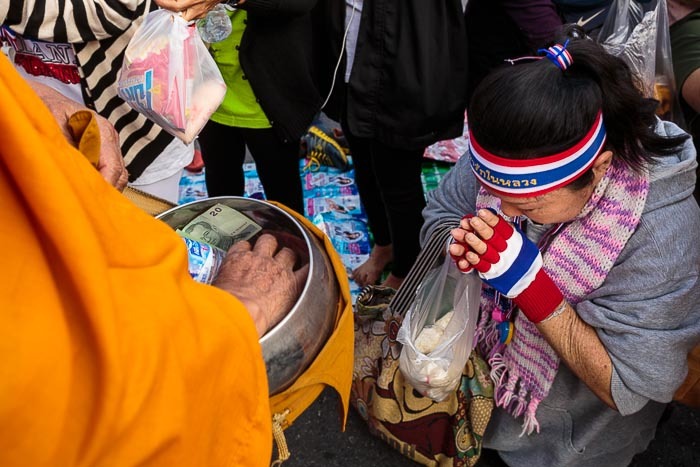 They filed silently through the crowd while thousands of people pressed in around them, presenting the monks with food, drinks and money. I didn't know the merit making ceremony was going to take place, but I thought it might. I was at City Hall for the Bangkok Metropolitan Administration's annual New Year's Day ceremony and City Hall is just a few blocks from Democracy Monument. When the BMA ceremony ended I walked down to the protest site to see what was what. They were just getting ready for their ceremony, which turned out to be nicer than the BMA ceremony where I started the day. A woman prays after presenting alms to a monk. There are more photos from the New Year's Day ceremonies in my archive or available from ZUMA Press.